A more beautiful butterfly diaper cake centerpiece would be hard to come by after looking at Beth's gorgeous diaper cake below. Truly fit for a special occasion, this diaper cake is colorful, bright, and attractive. I can't stop staring at it! There are no limits to the creativity and generosity of our readers. By submitting her ideas and photo, Beth has made this website a more helpful and a more rich resource for the rest of us. We have the greatest readers on earth! Thank you Beth for sharing your amazing diaper cake!! I used 88 size 1 diapers rolled them individually and secured them with a rubberband and then stacked them up in a circle and secured all of them with a large rubberband. I did the same thing for the second and third layers. I then tied ribbon around each layer to hide the rubberbands and added some beaded flowers and things that we bought from Hobby Lobby and viola!! 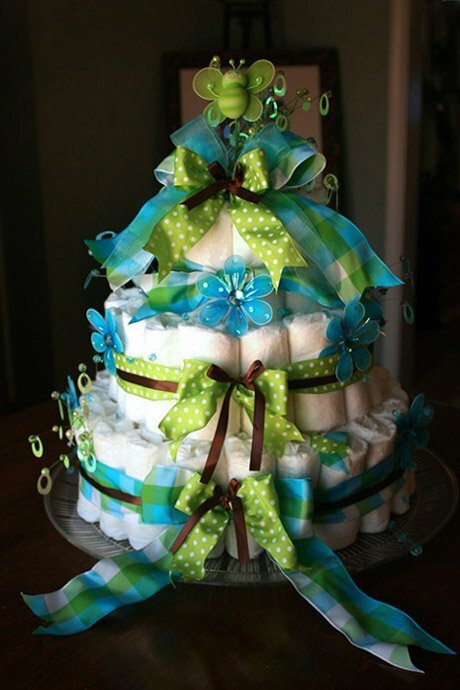 I had lots of fun making this diaper cake and thanks to your website it was super easy!!! The shower is March 8th, so I will post more pictures later. Absolutely Adorable! Thank you for sharing Beth!! After looking at this Noahs Ark diaper cake, you just might want to learn how to make your own diaper cake - find the easy-to-follow instructions right here !